Click here to see key post documents! The Sabattus American Legion Post #135 was chartered on December 15, 1924. The post is located on Island Road in the town of Sabattus, in rural Maine. The post is now it its 89th year of existence. Sabattus is a town in Androscoggin County, Maine, United States. The population was 4,876 at the 2010 census. The town was formerly known as Webster, and changed its name to Sabattus in 1971, in honor of a former Anasagunticook Indian chief. The town was first incorporated as Webster on March 21, 1788. The only parts of the town to bear the name Sabattus were the lake, river, and mountain. Over time, the spelling of the town’s changed from Sabattis to its current spelling. The post is named after Private Harry James Conway, United States Army. Date of Birth: April 9th, 1895, to Matthew and Mary Conway in Lisbon Falls, Maine. 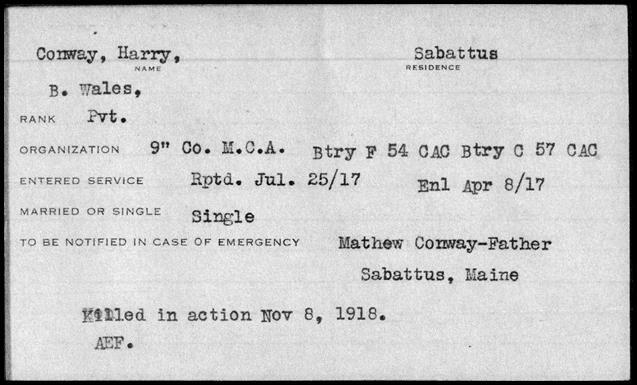 Enlisted: National Guard Lewiston, Maine, April 8, 1917. Reported for Federal Service: July 25, 1917. • Battery C, 57th Coastal Artillery Company (CAC) to Nov. 8, 1918. England: Toul Sector; Argonne Forest; St Mihiel. Overseas: March 22, 1918 to November. 8th, 1918. Killed in action: November 8, 1918. A Letter from Harry Conway to his Mother printed in the local newspaper. The 2d Battalion, 57th Artillery C.A.C. On the 20th of July, 1917, we left Ft. Williams, Maine, for the mobilization camp at Ft. Adams, Rhode Island. We arrived there in the afternoon of the same date. On the 21st of July, 1917, we were officially designated as Battery F and Battery G of the 6th Provisional Regiment, C. A. C. Previous to this change we were the 3rd and 4th Co's C.A.C., Ft. Williams, Maine. We remained in Ft. Adams until the 13th of August, 1917, going through an extensive training preparing us for Overseas duty. On the 13th of August, 1917, we left Ft. Adams for New York, arriving there at 2 A. M. on the morning of the 14th of August. We left the train at 7:45 A. M. and took the ferry across to Pier 54, Hoboken, New Jersey, where we embarked on the Cunard Liner, Andania, at 10:25 A.M. At 3 P.M. we were all ready and steamed out of the bay flying the British flag, with everybody below deck, No cheers, not even a smile to send us on our way to an unknown land, to fight for and protect that which we all love best, "Liberty"
The 2nd Battalion then known as the 6th Regiment, Coast Artillery Corps was the only unit carried by the HMS Andania on that voyage. On board were 108 Officers, 1,745 enlisted men and 1 Civilian. The only other ship to sail on the 14th of August, 1917 was the El Occidente with 67 Casuals. After an uneventful voyage of three days we anchored in the Bay of Halifax, Nova Scotia at 3 A, M, on the morning of the 17th of August, 1917. While here we had lifeboat drill and coaled up. Also we had a good view of submarines, as there were plenty of them in the bay. They were ours and the Allies, of course. After remaining in the harbor for four days we started on our uncertain journey across the Atlantic at 5:30 P. M. of the 21st of August, 1917, in company with six other ships, making a total of seven in the convoy. The convoy consisted of three troop ships, three freighters, and an auxiliary cruiser, each and every one fairly well armed as a protection against submarines. On August 29th, 1917, at 7 P. M. we were met five hundred miles off the Irish coast by a convoy of eight torpedo boat destroyers of the British Navy. August 31st, 1917, we pulled into Bentley Bay, Ireland, until the minesweepers could sweep the channel for us. September 1st, 1917, at 5:30 P. M. the all clear signal was given and we started on the rest of our journey, arriving at Liverpool, England, at 7 P. M., of the 2nd of September, 1917, after a nineteen day trip across the Atlantic looking for submarines. It has been rumored in German Naval circles, although never verified, that the submarine commanders were tried for neglect of duty in letting us get by them. Well, we were received with open arms by the British and sent to Camp Borden, England, arriving there at 9:50 A. M. on the morning of the 3rd of September, 1917, after an all-night ride in those quaint old-fashioned cars that are still in use in England. Upon our arrival at Camp Borden we were greeted by the British soldiers, who had a good substantial meal prepared for us, which we certainly did relish and enjoy, as it was the first real good meal that we had since we left the dear old U.S.A. We got the rest of the day off to straighten ourselves out and get our land legs back again. We remained in Camp Borden, England, until the 15th of September, 1917; during which time we went through an extensive training, preparing for the front line trenches in France. Part of our training consisted of cold water baths in the open air. At 8:40 A. M. on the morning of the 15th of September, 1917, we left Camp Borden for Southampton, where we took the Steamer Londonderry, at 7:30 P. M. for La Havre, France, crossing the English Channel, and arriving at La Havre, France, at 3:30 A.M. on the morning of the 16th of September, 1917, after one of the worst nights that we had ever put in up to this time. The steamer would accommodate comfortably about twelve hundred, and there were seventeen hundred and fifty of us on it, so you can imagine the crowded condition. But we never growled or grumbled because it had to be done. We disembarked at 8 A.M. and marched to Rest Camp No. 2, where we remained until 8:45 A.M. of the morning of September 17th, 1917, when we left Rest Camp No. 2 and entrained for the mobilization camp known as Camp Mally, arriving there at 10:45 A.M. on the morning of the 18th of September, 1917. This camp is a real good camp and is situated thirty-five miles from No Man's Land and is used principally for mobilization purposes. We immediately started our training and on the 25th day of September, 1917, we, with Battery H. were detached from our regiment and attached to the French mission and sent to French Artillery Headquarters at Noialles, reporting to same on the 26th day of September, 1917. After reporting, we were assigned to Billets, F Battery in Ponchon, G Battery in Pierrepont and H Battery in Roye. We spent the time between September 26th and October 1st, 1917, in cleaning up our new homes and making ourselves comfortable. October 1st we were loaned two new type French guns known as the 155mm GPF gun, so as to become thoroughly familiar with same, as it had been decided to equip quite a lot of American troops with said gun. We spent the time from October 1st to December 3rd, 1917, in drilling and becoming qualified in the use of said gun. On December 4th, 1917, we were motorized and issued eight of these guns, being the first American troops overseas to be motorized and we drew the first eight guns of this type put out for the American troops. Our guns were numbered from 1 to 8 inclusive, Battery F drawing from 1 to 4 inclusive and Battery G from 5 to 8 inclusive. From the 4th of December to the 23rd of December, 1917, we spent our time in becoming familiar with our new transportation, which, being new to us, required quite a little time to become perfect. For the guns we had Renault forty-five horsepower tractors and Latil thirty horsepower tractors for gun material. For personnel we had three-ton White trucks. And I might mention here that during our stay here the second Liberty Loan was floated and we bought thirty-five thousand dollars worth of bonds. We had from the 23rd to the 26th of December, 1917, off to enjoy the Xmas holidays. After successfully passing the required examinations of the French, we were ordered to Camp de Souge, near Bordeaux, to train incoming troops in the art of handling this gun, which proved Germany's downfall. In compliance with these orders we left the French Artillery Headquarters and entrained at Beauvais and left this district at 12:30 P.M. on the 28th of December, 1917, arriving at Camp de Souge at 6 P.M. of the 31st of December, 1917, after a very cold and strenuous ride of three days and nights in boxcars and trucks, but none the worse for our trip. The month of January, 1918, was spent in convoy practice and target practice, in which we came up to the required percentage demanded by the French mission. From February 1st to April 7th, 1918, we spent in training the 146th and 148th Field Artillery in the art of handling this type of gun. During this period of training the 146th and 148th F. A. we were changed from Batteries. F & G, 6th Regiment C. A. C., to Batteries. F & G, 51st Artillery. C. A. C. The change taking effect on the 27th day of December, 1917, but we did not receive the order until February 15th, 1918. On April 8th, 1918, we were ordered to Libourne to receive a post graduate course in the School of Musketry and in the Tractor School. We completed this course by May 10th, 1918, and were ordered to get ready for active service at the front. This news was received with profound joy throughout the Battalion. May 11th, 12th, and 13th were spent in making preparations for this great event and on May 14th, 1918, we left Libourne for the front in the Toul sector, arriving in the danger zone May 17th, 1918. From May 17th to September 11th, 1918, we were facing the enemy. On May 19th, 1918, there was an air raid over our sector, and Major Lufberry (at that time the American ace) was accidentally killed by falling out of his plane while chasing the Huns. On May 26th, 1918, at 11:55 P.M. we fired the first shot at the enemy that was fired by American troops with this type of gun in this great World War, From then until September 11th, 1918, we exchanged shots with the Huns every day. Also our aviators exchanged visits every day with them. We had our first casualties on the 22nd of July during a night air raid when two men of Battery F were killed and a man from Battery H was wounded. On the 15th of July, 1918, our official designation was changed from Batteries. F and G, 51st Art. C. A. C. to Batteries C and D, 57th Artillery C. A. C., 31st Brigade, Army Artillery, First Army. At 12:59 A. M. on the morning of the 12th of September, 1918, the world was electrified by the announcement of a barrage put over by the Americans and French. This was the largest barrage ever put over by any troops up to this time and we had the honor of starting it in our particular sector. This drive is known as the great St. Mihiel drive and is famous because of its magnitude and effectiveness. There was more artillery mobilized for this drive than for any other drive previous. This drive lasted for three days and was a complete success from every point of view. We suffered no casualties. On account of our excellent work in this drive we got a letter of commendation which is herewith produced. These letters are generally termed citations, and it makes one feel proud to get them. After things quieted down in this sector we got orders to go to the Verdun front and take part in a drive to be pulled off there; so on September 18th, 1918, we left the Toul sector and proceeded to go to Verdun in compliance with our orders. We arrived and made our echelon at Souohsine-la Grand on the 20th of September, 1918, where we were joined by the rest of our regiment and took up position at Monceville the night of the same day. This was a particularly dangerous position as it was in the open and all work had to be done at night. We were in plain view of the Huns so we had to be extremely careful in the use of our camouflage. We got in position very soon after our arrival and at 11:30 P. M. of the 25th of September, 1918, we got orders to open up. And again the world was electrified by the immensity of the barrage. This barrage is called the million-dollar barrage. And in less than five hours after we opened up the Huns were on the run. We suffered no casualties at this position. We remained in this position until October 2nd when we advanced about fifteen Km. and took up position at Cuisy and opened up another barrage at 1 A. M. on the morning of the 4th of October, 1918. This barrage was not so intense as previous barrages. We remained in this position firing intermittently until the 13th of October, 1918, when we advanced about ten Km. and took up position at Eclisfontaine. We never opened up a barrage from this position, but fired intermittently until October 25th, 1918, when we again advanced about five Km. taking up position at Romange. At Eclisfontaine our casualty list consisted of one man wounded slightly. The last three named positions, namely Cuisy, Eclisfontaine and Romange we went in position under machine gun fire, disregarding the terrible Huns and their deadly fire, but neither the terrible Hun or his deadly fire proved effective as far as casualties were concerned, only at the last named position, Romange, where we had six killed and eighteen wounded. Romange was our worst position on account of such close range and the delay of other units getting into position. At last the stage was set and the order came to open up the big show at 12:55 A. M., the morning of the 1st of November, 1918, and we thought that we had put over some barrages, but this one exceeded all others in every respect and was the last barrage of any consequence on our front, and was the indirect cause of Germany asking for an armistice. A German Major taken prisoner made the remark that there was nothing could live under an American barrage. The ground looked as though it had been freshly ploughed. We remained in this position until November 6th, 1918, when we advanced about fifteen Km and took up position at Beaufort where we remained until the 24th of November, 1918. At Beaufort we fired the salute of forty-eight shots to the Union Jack on the day the armistice took effect, therefore having to our credit the last as well as the first shot fired by American troops with this type of gun. We commenced firing these shots at 10:50 A.M. and fired the last one at 10:59 1/2 A. M. using as our targets three cross roads heavily convoyed by German troops. In appreciation of our excellent work during this offensive we received six letters of commendation from Brigade Headquarters at different intervals of the offensive, which are herewith produced. Our causalities here were two killed and two wounded, making our total casualties from the time we left the U.S. until the armistice was signed, eleven killed and twenty wounded. Of the twenty wounded one will be a cripple for life, while the other nineteen will be restored to normal condition. This offensive was known as the Argonne-Meuse offensive and the decisive battle of the war. And now since the armistice has been signed and we have assumed that watchful waiting policy, I feel duty bound to mention the good work done by our detachment of Headquarters Supply and Medical Corps. Too much cannot be said of the excellent work performed by these two detachments. Much credit, in fact the larger portion of the credit, for the maintenance of this battalion in supplies of all kinds is due 1st Lieut. Alvin Johnson, who was in command of Headquarters and Supply Company, and Sgt. Major Henry Rice, who was Battalion Supply Sgt. It was through their untiring and unceasing efforts that this Battalion was at no time out of supplies, that were necessary for the maintenance and upkeep of an efficient Battalion. At no stage of the game were we ever short of supplies. And for the excellent health enjoyed by this Battalion, credit is due our able and efficient Medical detachment. And now we will return back to Beaufort where we are still watching the movements of the Huns. We remained in Beaufort until the 24th of November, 1918, when the all-clear signal was given and then we started for the rear to turn in our implements of war and get ready to return to our beloved country. We left Beaufort on the morning of the 24th November, 1918, by convoy, and arrived at our destination, which was Dommartin, on the 29th of November at 3 P.M., passing through the following towns and spending from three hours to an entire night in each. Romange, spending the night, Auzeville, spending the night, Nubecourt, spending a day and night, Bar-le-Duc, stopping long enough for Thanksgiving dinner, Dammarie, spending the night, and then to Dommartin; where we took up temporary headquarters until we could turn in all property not destined to come to the U. S. with us. After a three day travel in American boxcars we wound up at Brest; our port of embarkation. On our trip to Brest we passed through the following large cities: St. Florentin; Vergigny; Joigny; Cravant; Bagaines; Clamecy; Moulot; Billy-sur-Oise; Etais; Cosne; Beirjoin; St. Pierre-des-Corps; Mettray, St. Paterne; St. Christophe; Chateau-du-Lois; Camp Eta for U. S. Engineers; Leman, Laval; and Morlaix. Upon arrival at Brest, we "hiked" out about three miles to a camp of mud and water. We were put into tents; where we remained until the 29th of December; 1918; and then moved to Billets; where we remained until the 2nd of January; 1919; on which date we embarked on the U. S. S. Huntington for our trip to our beloved country. Our trip across was uneventful with the exception of two days rough weather and the usual amount of seasickness. We arrived safely the morning of the 14th of January; 1919; docking at 9:35 A. M. at Pier 5 Hoboken, N. J. We immediately disembarked and entrained for Camp Merritt; N. J.; arriving there at 2:30 P. M. and going into barracks for the time being. At 3:30 P. M. dinner was served and at 7:10 supper was served and at 8:50 P. M. we went to the delousing station and all hands were deloused; and God knows we needed it. Delousing process completed about ten o'clock and we turned in for a much needed rest. The next day, January 15th, 1919; at 2 P. M.; we entrained for New York; arriving there about 5:00 P. M.; where we took the ferry across to Sandy Hook, New Jersey; arriving there about 7:30 P. M. and here is where I am going to leave you; patiently awaiting your discharge from the Army, so as you may go out into the world and make history for yourself instead of for the Battalion. And now just a few words in conclusion. I wish to call your attention to a few coincidents. · We sailed for Overseas Duty August 14th, 1917. · We returned from Overseas Duty January 14th, 1919. · We arrived on foreign soil September 2nd, 1917. · We left foreign soil on January 2nd, 1919. · We were equipped and motorized December 4th, 1917. · We turned in equipment on December 4th, 1918. · The Armistice went into effect at the eleventh hour of the eleventh day of the eleventh month. · And now just a thing or two worth remembering; That we fired the first shot that was fired at the enemy by American troops with this type of gun. · That we fired the last shot that was fired at the enemy by American troops with this type of gun. · That we were the first American Artillery unit to be equipped and motorized in France. That we drew and used the first eight guns of this type made for the use of American troops. That we fired twelve thousand, five hundred and eighty shots at the enemy. Sgt. Bat. D, 57th Art. C. A. C.